This post will be longer than my usual posts, because I want to share a special afternoon with you. Yesterday I went to my dear friend Angela’s house, little did I know I was going to take a sweet culinary trip to the Middle East with a baklava master. 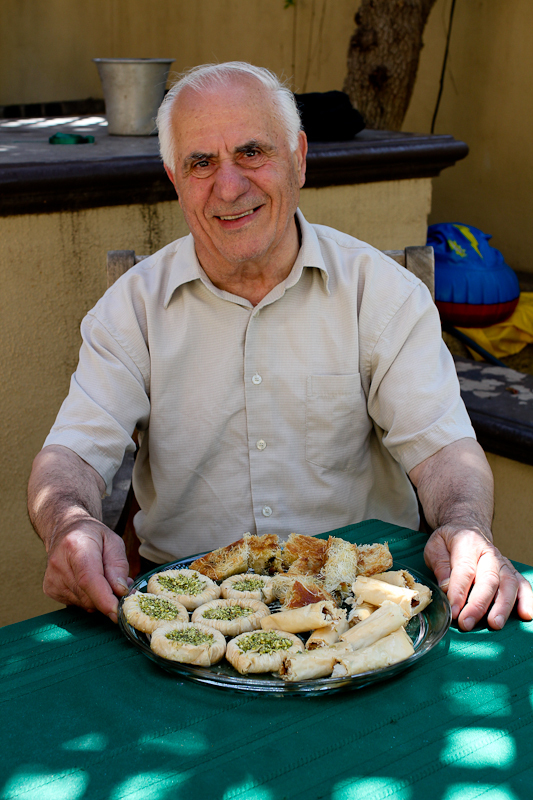 Her father, Joseph, was visiting and he was making baklavas from scrath. I watched and documented every minute of the process. Although baklavas don’t exactly fit my easy, simple, healthy criterias, I want to share this production with you. Baklavas are time consuming, though not too difficult and so worth the effort, I hope you agree. Here are Joseph’s original recipes as told to me while working. You can make them yours by using other nuts, spices even dried fruits. You can also make the simple syrup with honey and add eg. orange blossom water instead of rosewater. Be creative and have fun. Joseph made 3 kinds of baklavas: Walnut rolls with cinnamon. Rounds almost resembling little birds’ nests with pistacio nuts, and crisp rolls with whole pistachio nuts. Master Josesph used both regular phyllo dough and a shredded phyllo, which I had never laid eyes on before. If you are in LA, you can buy shredded phyllo at Valley Produce Market for everyone else, try asking at your local markets. 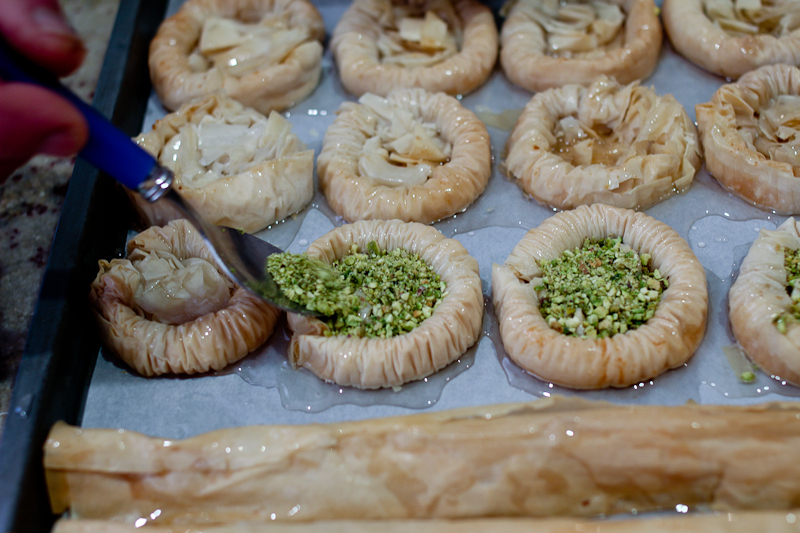 Regular phyllo dough can be bought in the frozen section of most supermarkets. Bring the water and sugar to a boil over high heat, then lower to medium heat and let simmer for 10 min. Take the pot off the heat and add lemon juice and rosewater. Cut the sheets of phyllo dough in half. Grab 2 sheets of phyllo at a time and brush the top lightly with butter (they may crumble a bit, ours did, that’s not a problem). Sprinkle walnuts on the long end of the sheets and dust the nuts with ground cinnamon, if using. Roll the sheets into a small log and transfer to a sheet pan with parchment paper. Contiune until all the phyllo dough is used. Brush with melted butter on top, before baking for about 25-30 min. You want a light golden color. When baked let the walnut rolls cool slightly, then brush them with the rosewater simple syrup and finish by adding a bit of the finely chopped pistachio nuts (we ran out of pistachios, so this step is not pictured) You can also top with other nuts, cinnamon sugar or what ever else you can think of. Cut each roll into four pieces. 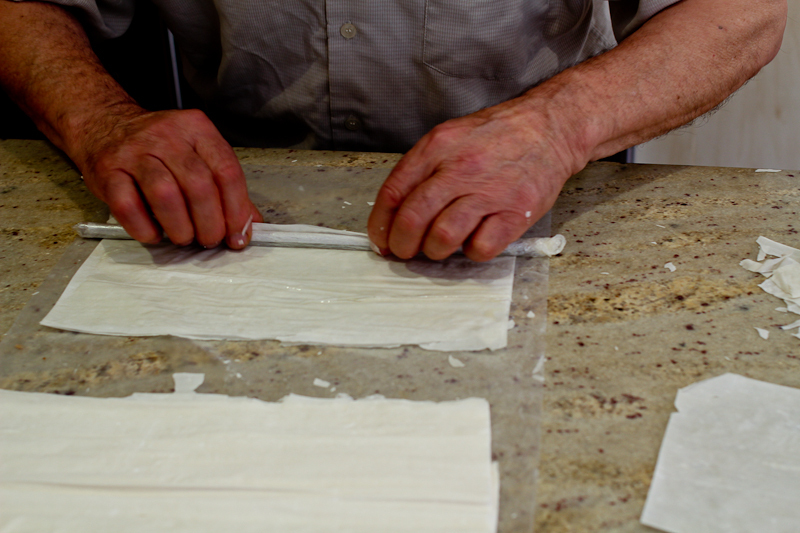 Depending on the size of rounds you want, you can either cut the phyllo in half or leave them uncut. We used half sheets. 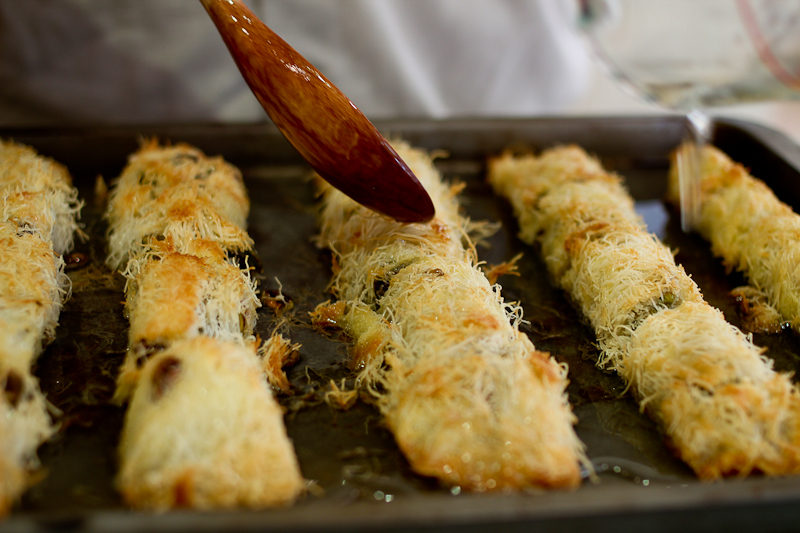 Grab 2 sheets of phyllo at a time and brush the top lightly with butter. 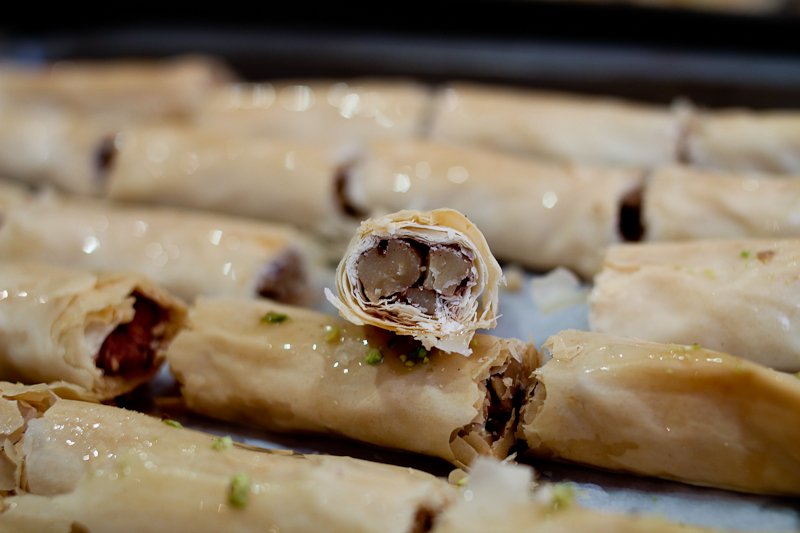 Roll around the plastic wrapped stick and stop when there is 1 inch of phyllo dough left. While still on the stick, push the dough together to wrinkle it, then pull out the stick and form rounds. The last inch of dough will become the bottom of the rounds. You can push down the center dough just a bit. Repeat until you have the amount of rounds you want. 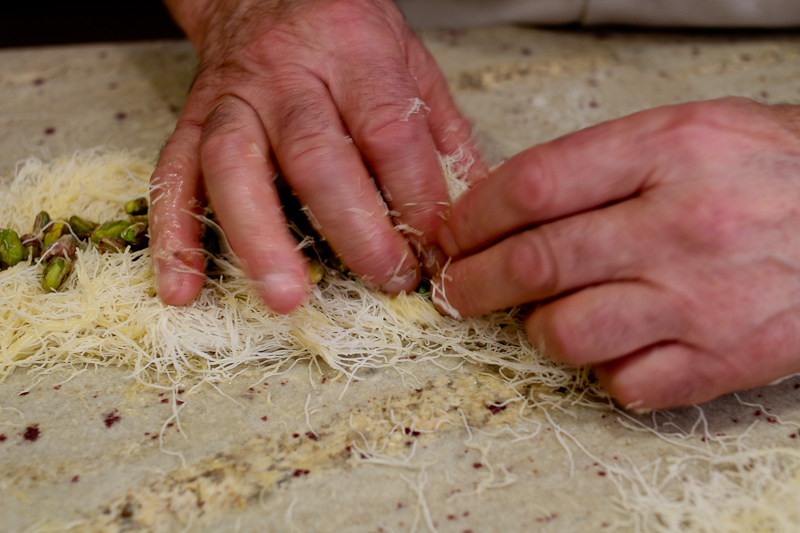 The stick and the size of the phyllo sheets will determine the size of the rounds you make. Brush the rounds lightly with butter and bake about 25-30 min until light golden. When baked let the rounds cool slightly, then drizzle with rosewater simple syrup, fill them with the pistachios and drizzle generously with the rosewater simple syrup one more time. Put softened butter in a small bowl, add 3 tbsps of the luke warm rosewater simple syrup then stir well. Add the 2 eggs to the mixture and set aside. 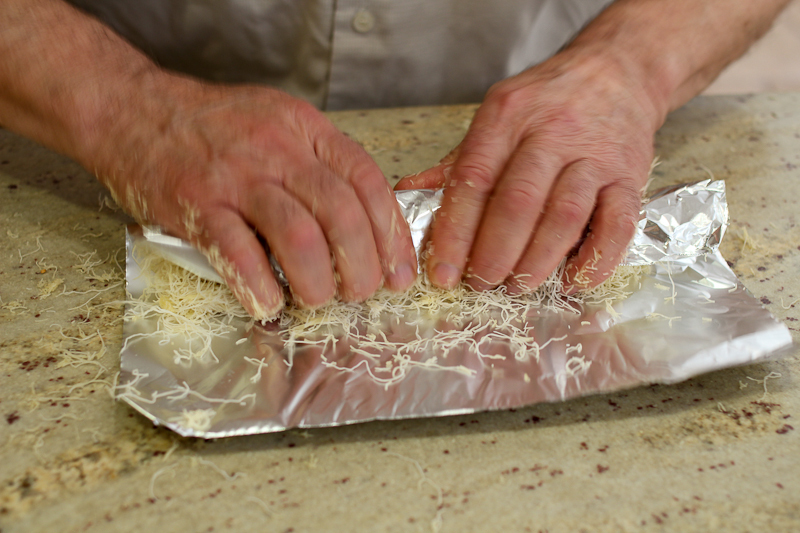 Shape shredded phyllo dough the size of a half sheet pan right on the counter about 1″ high. Then drizzle the butter-egg mixture evenly on top without touching the dough. Pull a strip of dough off with your hands (about 6 strips total), make a dent in the middle and fill with pistachio nuts. Then roll it to form a log. Continue to make 5 more logs. Wrap each log individually in foil paper and press them together, this is very important and will help hold the rolls together. Bake about 15 min. Let the logs cool a bit before you unwrap them otherwise they will stick to the foil. When unwrapped drizzle the logs with the melted butter. Cut each log into 6 pieces, but leave the pieces together. It is easier to cut into the rolls now, after they are baked the rolls will be too brittle to cut. Raise the temp to 375F/190C and put the rolls back in the oven for another 30 min until golden brown. They can go a little more brown than pictured. Cool the rolls about 15 minutes before drizzling with the rest of the rosewater simple syrup. Have your ingredients ready before opening the thawed phyllo dough, it dries out quickly. Roll out the sheets of phyllo and cover with a damp towel to keep them moist. Cut phyllo dough with scissors. This entry was posted in Sweets and tagged baklava opskrift, baklava recipe, baklava with pistachio nuts, baklava with rosewater, baklava with walnuts. Bookmark the permalink. Vidste ikke hvad baklava er – før nu! Desværre mangler der billeder??? Thank you for posting these recipes. 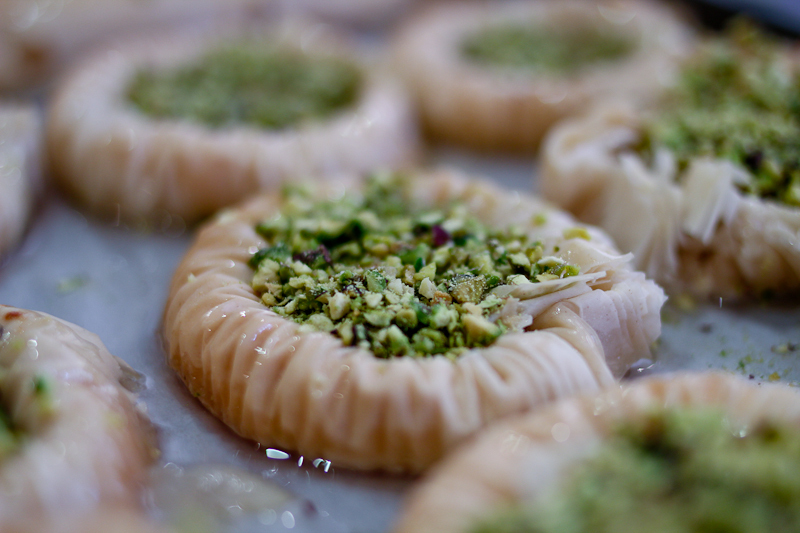 I have been looking for a recipe that showed how to roll the round baklavas and I’m so happy I finally found it!